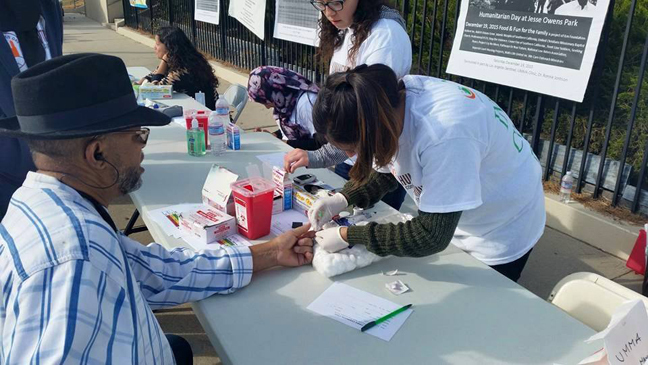 The atmosphere at Jesse Owens park was festive Saturday December 19, as the community came out to enjoy Humanitarian Day, where free toys, turkeys, medical screenings fun and games were offered up by organizers of the Safe Communities Initiative. Before the clouds blew in and the rain poured, people lined up in droves, empty handed, but left with an abundance of holiday goodies. Humanitarian Day is just one event the group has organized to address more than 40 homicides that took place in Los Angeles earlier this year. “This our community, this is our life,” said volunteer Saadiq Safir. And that, Safir said, plays a big role in curbing violence in the community. A prayer was held at the event for 40 individuals who lost their lives in the spate of recent violence, in addition to 14 balloons being released for the victims of the San Bernardino shooting. “We know what works,” said Khalid Shah, one of the organizers of the initiative. Having the festivities at Jesse Owens held significance for the Safe Communities group, since that community was the seat of a local gang threat, to shoot 100 people in 100 days. That threat, plus the surge in violent homicides in the 8th and 9th districts in particular, sparked a series of meetings that included more than 80 of the most influential intervention and prevention experts in Los Angeles County. On September 2, a meeting was held at the headquarters of the Los Angles Sentinel Newspaper. Sentinel Publisher/ CEO Danny Bakewell Sr. has greatly supported the effort, donating an initial $10,000 to assist. “It was really an extraordinary afternoon to see all of the brothers come together in the name of peace in our community, to see families gathered for that purpose,” he said. Those people, under event host Rizilient, a local organization from the Jesse Owens community working with at-risk youth, included six different neighborhood gangs, which partnered with Safe Communities, agreed to start working together to cease the violence in their respective communities, according to Shah. “They are going to start working on things like education, voter registration and unmet shelter needs for their neighborhoods,” he said. Meanwhile, Bakewell Sr. said he was “honored” and “humbled” to be, along with others like actor and director Bill Duke and NBA star Russel Westbrook, recognized for all of his efforts in uplifting the community. “I have a great deal of respect and admiration for all those who pulled this together to ensure that the future of our community is safe and secure,” he said. Humanitarian Day is the product of the ILM Foundation in conjunction with United Christian Missionary Baptist Church, Watts Life United, Professional Com­munity Intervention Training Institute International, Southern California Cease Fire Committee, Nation of Islam, Front Line Soldiers, Seeking Peaceful Solutions Inc. ,National Low Riders Association, Stop the Violence Increase the Peace Foundation, ILM Foundation, a host of other community and faith-based agencies. Its primary sponsor is Los Angeles’ UMMA Clinic. 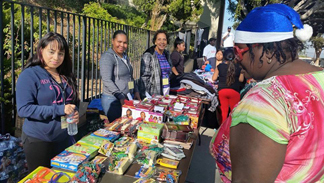 The Safe Communities Initiative is headed by Professional Com­munity Intervention Training Institute, Watts Life United, Stop the Violence Increase the Peace Foun­dation, Los Angeles Sentinel and LA Watts Times.